I am going through a bit of a healing crisis which is to be expected from time to time as the body makes every effort to eliminate backed up waste matter. Elimination is one of the major factors in living in health. That's why clean eating is so important. We don't want the waste to accumulate faster than the elimination process can work, otherwise, you are being set up for chronic illness. That is also the reason we are so opposed to the suppression of these healing symptoms. 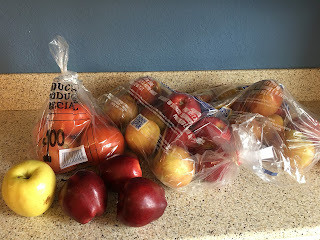 Juice for two using 5 apples and 1 pear. Fruit smoothie for lunch : 2 bananas, 1/4 cup ground flaxseed, 1/4 pineapple, 1/4 papaya, 1 cup frozen wild blueberries, 6 big strawberries, water. Grocery haul today. Travis bought 10 lbs apples, 4 loose apples and 5 tomatoes for $11.29 at Food Wise. Natural Hygiene, or the simple, natural life as I like to call it, is not really so difficult once you realize it is not a life of deprivation, but rather the opposite; it is a life of abundance. It is a letting go of all that is not "real". It is liberating to let go of false ideas that we have been taught and for which we hold so many references. Natural Hygiene and Nature Cure look for the root cause of our problems. Mental tension is reflected in the body. When we are dedicated and disciplined the results are worth the work required. As we do the work we learn from our own personal experience, and this is much better than second-hand learning. Here I am having dinner with the family. Two YouTube channels that may be of interest to health seekers. There is a YouTube channel called Chris Beat Cancer with a lot of information for anyone that is interested in dealing with cancer in a natural way. Of course, what works for cancer will work for any disease, as the diagnosis is not that important. The important thing is to give your body everything it needs and eliminate everything it does not in order to give it every advantage you can. The body is a self-healing mechanism. John Rose also has a YouTube channel with a series of videos on doing a solid food vacation as a way of breaking free of your habitual way of eating. Another YouTube channel I am liking right now is Jack Albritton at Raw Tropical Living.